The BIOSTAT® RM TX system consists of an automated control unit and a rocking platform, for gently agitating a single-use Flexsafe® RM bag. Enabling the ex vivo expansion of patient-specific T cells or other types of immune cells, the BIOSTAT® RM TX is suitable for process development, as well as for the expansion of relevant cell numbers. Fed-batch, perfusion processes or a combination of culture modes are all possible with this system. At Sartorius, we help you develop a scalable, cost-effective process and combine this with the security of our worldwide supply chain and manufacturing capabilities. Our expertise and experience allow us to support early stage process development and establish scalable processes. The complete control of our raw materials, the extrusion process and the bag assembly, provides lot-to-lot product consistency. In collaboration with our resin and film suppliers, we have optimized the resin and minimized the additives in our Flexsafe® film technology ensuring excellent, reproducible batch-to-batch culture performance of even the most sensitive cells. Conventional harvesting procedures can reduce the number of live cells and affect cell viability. Since cell yield is critical for autologous cell therapies, we have designed our Flexsafe® RM TX bags with a special port for hands-free gravity harvesting. This unique gravity harvesting concept in combination with the Flexsafe® RM TX Harvest Device allows the safe recovery of as many cells as possible by reducing shear stress on these delicate cells and minimizes contamination risks from manual handling. Our BIOSTAT® B control unit is ideal for walk-away automated analysis and control of perfusion cultures. Up to 4 internal pumps can be integrated into control loops for ease of operation without the need to constantly change the pump's function. Together with the control tower the integrated temperature control is optimized for small working volumes and perfusion membrane bags. The BioPAT® MFCS multi fermenter control system or third party SCADA system integration (DeltaV™) ensures reliable data management and automation. Contains aeration, pumps and temperature control modules for various application needs. The BioPAT® MFCS multi fermenter control system ensures reliable data management and automation. The integrated precise load cells are ideal for small volume perfusion processes. 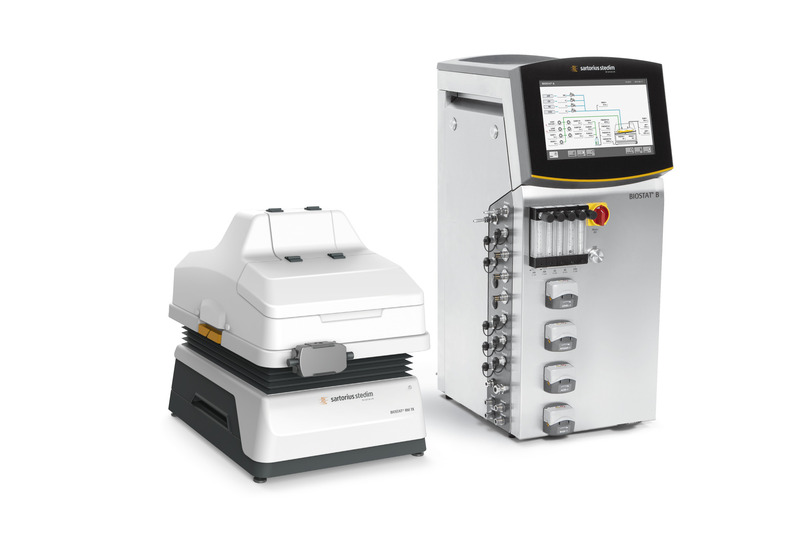 Easy-to-use and reliable operation of your BIOSTAT® RM TX system due to intuitive design of human-machine interface and advanced touch-screen technology. Integrated perfusion membrane; Integrity tested Sartopore® Air vent filters; Industry leading Flexsafe® film; Single-use pH, DO and online biomass sensors. Disclaimer: BIOSTAT ® RM TX and Flexsafe® RM TX bags are for research use or further manufacturing use only – not for use in therapeutic or diagnostic procedures. They are not CE marked for in vitro diagnostic use nor are they medical devices. Drug manufacturers and clinicians are responsible for obtaining the appropriate IND | BLA | NDA approvals for clinical applications.